UK: Vessels supplier Seajacks has been awarded the contract by Dong Energy to install both sets of turbines at the 660MW Walney Extension project. Seajacks will use its new Scylla installation vessel currently under construction in South Korea. The UK firm said it would fit the vessel with an adaptable blade rack and sea-fastening solution to help it switch between two types of turbine. MHI-Vestas V164 8MW and Siemens 7MW machines are likely to be used on the project after the two manufacturers were named preferred suppliers. 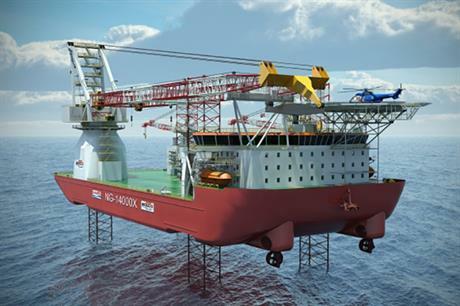 Seajacks said the system should reduce mobilisation costs and benefit future projects. The Walney Extension comprises two 330MW phases. Phase one is set to use 41 V164 turbines, while the second phase should see 47 Siemens turbines installed. The projects is scheduled to come online in 2018 and 2019 respectively, according to Windpower Intelligence, the data division of Windpower Monthly. The extension is located 19 kilometre's off the UK's west coast in the Irish Sea. Seajacks previously helped to install Dong's original 367.2MW Walney project, commissioned in 2012.